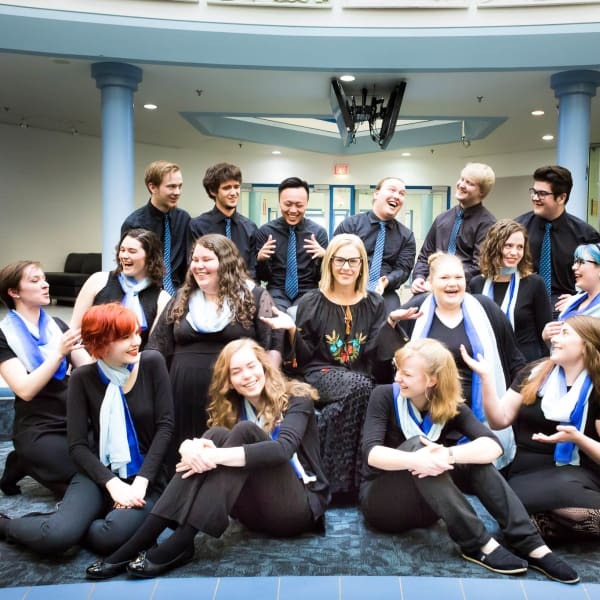 The King’s University in Edmonton has a thriving music program that includes three performing choral ensembles: The King’s University Concert Choir, Chamber Choir, and Community Chorus. The Concert Choir was established in the founding year of the College, 1979, the Chamber Choir was added in the 1990s, and in 2006, we started a Community Chorus. The Community Chorus consists of faculty, staff, and all others who simply want to sing. Since 2002, The King’s University Choral Program has grown substantially under the full-time leadership of Dr. Melanie Turgeon, presently including approximately 75 choristers. At the conclusion of each academic term the choirs join forces and perform a major concert. This massed choir has been asked to perform with various local orchestras and ensembles; most notably, the Edmonton Youth Orchestra, Orchestra Borealis, Mill Creek Colliery Band, among others. All three King’s Choirs collaborated to produce a recording, The Voice of My Prayer, which they released in 2011. Although King’s Choirs have embarked on previous international tours to Germany and parts of Eastern Europe, for the first time in our nearly 40-year history, singers from all three choirs, including the Community Chorus, were represented on the 2018 tour to The Netherlands. The King’s University was founded by Dutch immigrants; thus, this tour was a way of remembering and honouring this heritage. The King’s Community Chorus is presently under the leadership of sessional conductor, Dr. Evelyn Grieger. They are privileged and excited to participate in this concert with the ESO!